Following the June 6 reveal of Tetris Effect, PlayStation is continuing its countdown to E3 2018 with another announcement. 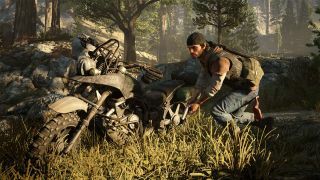 This time, as promised, Sony has confirmed the release date of Worldwide Studios PS4 title Days Gone. The game will be launched on February 22 2019. Announced at E3 2016, Days Gone from Bend Studio is an open-world zombie apocalypse survival game that sees players take the role of a gritty hero with a motorcycle steed. A motorcycle steed which, it seems, you definitely don't want to break down. The game looks wild, violent and more than a little bit scary. With two announcements down, we now have three more to go. These will include the reveal of brand new PS4 and PS VR titles as well as a much-anticipated PS VR port. TechRadar will continue to report the latest PlayStation news in the run up to the E3 presentation when we’ll be coming to you live from Los Angeles.